Migrants stranded for days on board a humanitarian ship are to be redistributed among Germany, France, Portugal and Luxembourg, the government said on Saturday. They will be taking in the more than 60 stranded on the German rescue ship Alan Kurdi off Malta. The migrants arrived in Haywharf around 6.30pm. It said in a statement that none of the migrants will remain in Malta and the ship will not be allowed to enter port. A total of 64 migrants, including 12 women and a baby, were picked up off the Libyan coast on April 3. The rescue ship, operated by the German charity Sea-Eye, is the latest to be left adrift off the coast of Europe where governments are increasingly trying to push migrants back towards Africa. Sea-Eye initially tried to land on the Italian island of Lampedusa but Italy's far-right Interior Minister Matteo Salvini - who has turned away several rescue ships in the past year - rejected the migrants, saying that Berlin should take them instead. He eventually agreed to let two minors and their mothers disembark, but they refused to do so without the children's fathers, who were not allowed off the ship. The ship then headed towards Malta. Malta refused to let rescued migrants land but made an exception for two women who were evacuated to Malta because they were in urgent need of medical attention. Maltese authorities also authorised food and water to be delivered to the vessel, which had been forced to ration supplies. 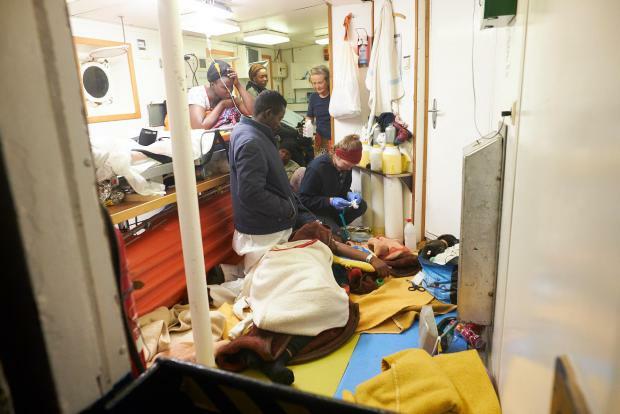 The rescued migrants and 17 crew were all sleeping in a room designed for 20 people. Around a third of those rescued are suffering from sea sickness, Sea-Eye said. The Sea-Eye NGO said the lives of 64 people are now in the hands of people who needed 10 days to negotiate “simple, fundamental and humanitarian” issues. In a harshly-worded statement, the NGO said it could not understand why it was necessary for migrants to remain stranded on board while governments engaged in negotiations. 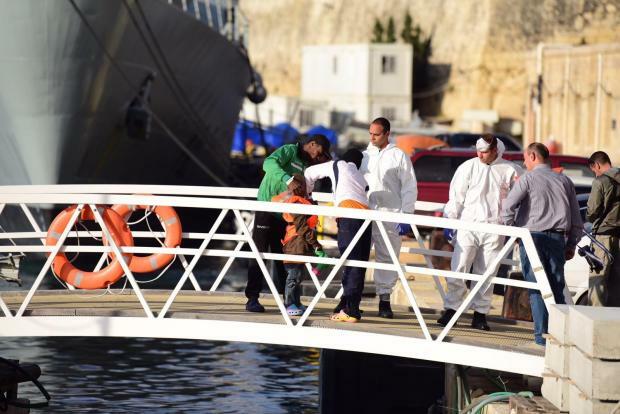 Sea-Eye said the Maltese authorities appeared to expect the Alan Kurdi to navigate to a Tunisian port. "We are not aware that the Italian Coast Guard or the Maltese amy ever brought people rescued from distress at sea to Tunisia. We don't understand why they again and again want to force us to break the law," said Jan Ribbeck, Sea-Eye’s head of operations. The NGO said eight people drowned in the past days, because the Libyan coastguard first had to be alerted by other rescue centres of a sea emergency in their area of responsibility. "If you give Libya responsibility for a search and rescue zone, you have to be able to ensure that Libya can live up to that responsibility. At the moment this is not the case. So who is responsible?,” spokesman Gorden Isler said. Amid the recent political developments, Mr Isler said the International Maritime Organization should declare the central Mediterranean sea area a “death zone” and not a search and rescue zone. The Alan Kurdi is named after the three-year-old Syrian boy whose body washed up on a Turkish beach at the height of the European migrant crisis in 2015. Pictures of his lifeless body caused a global outcry over the migrants' plight. The government thanked the European Commission for coordinating the matter and the four states for their intervention. It said that once again, the smallest member of the European Union was put under unnecessary pressure by being asked to resolve a case which was neither its responsibility nor its remit. A solution was found not to let the situation deteriorate further while making it clear Malta could not keep shouldering this burden. Malta called on the NGOs to abide by all applicable conventions and regulations. 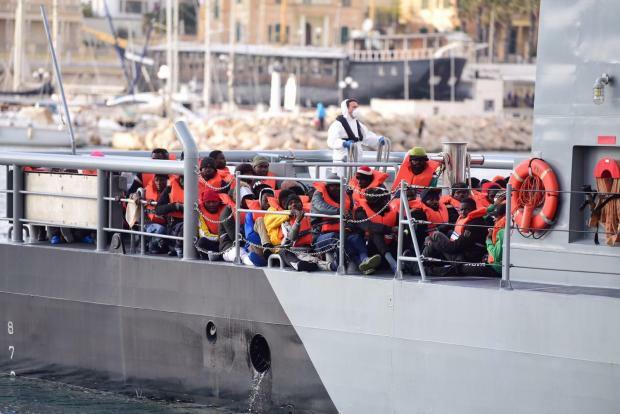 France, Spain, Germany and other EU countries have stepped in on several occasions in the past year to take in migrants rejected by either Italy or Malta. In a short statement on Saturday night, the UNHCR said the migrants were relieved that the ordeal is over. It thanked the Maltese government of Malta for allowing the disembarkation and France, Germany, Portugal and Luxembourg for showing solidarity in relocating. However, UNHCR stressed the need for predictable mechanisms to ensure timely disembarkation in a safe port. Watch: Can you speak Maltese as well as Jinjing?